Today is a Japanese National Holiday. Long weekend is always welcome! I promised my friend, Hiromi, yesterday to go to get some crawfish at Shinjuku Chuo Koen (Shinjuku Central Park), but mom and dad wanted to get origami video taken so bad before I go out with my friend. 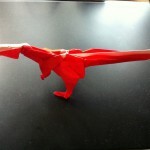 I made an origami of Pteranodon. See the photo below. Yellow origami is my work. I put it onto my favorite pictorial book dinosaurs. Instruction video will be uploaded shortly. 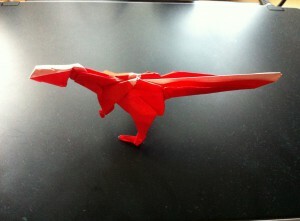 I can make many origami these days because the school is closed for spring vacation. 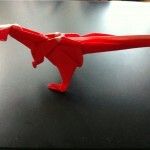 Please look at Coelophysis I made! 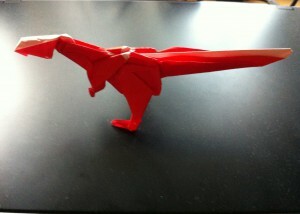 Coelophysis origami created on April 4, 2011.